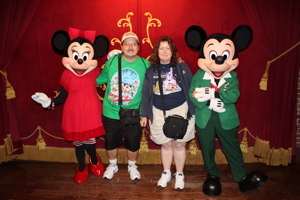 Denise and I met Mickey and Minnie at Town Square Theater (below, left), they were dressed in their resplendent Christmas outfits. 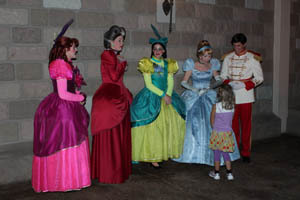 Cinderella and Prince Charming greeted guests in Fantasyland, along with the evil stepsisters and wicked stepmother (below, right). 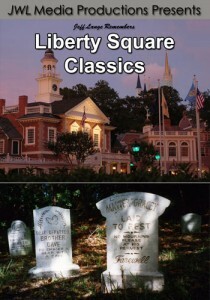 They make quite an interesting lineup! 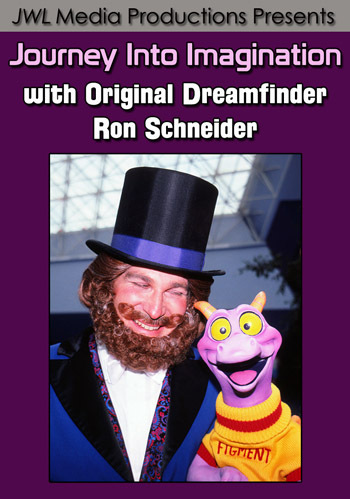 There are a lot of wonderful meet-and-greets at the Party. 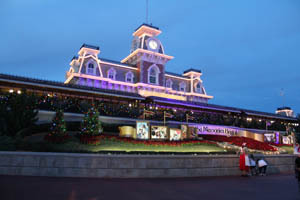 Video #1 – Mickey and Minnie in Holiday Outfits at Mickey’s Very Merry Christmas Party 2012 Magic Kingdom – Mickey and Minnie greet guests at Mickey’s Very Merry Christmas Party in their Holiday outfits! 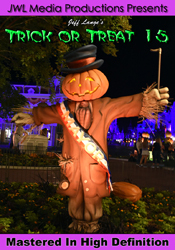 Scrooge McDuck (below, left) poses for us in Fantasyland, not far from the former Snow White’s Scary Adventures attraction. 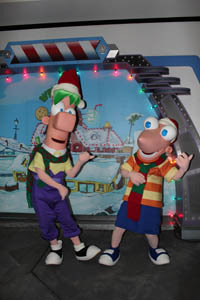 Phineas and Ferb (below, right) play air guitar while decked out in their holiday hats and scarves. 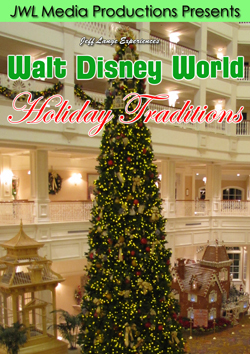 Video #2 – Scrooge McDuck at Mickey’s Very Merry Christmas Party, Magic Kingdom Walt Disney World – We spent a bit of time at Mickey’s Very Merry Christmas Party with Scrooge McDuck! 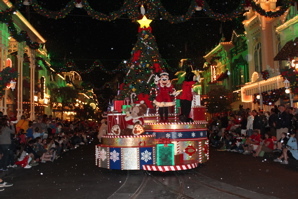 Mickey’s Once Upon a Christmastime Parade is always a favorite of ours! 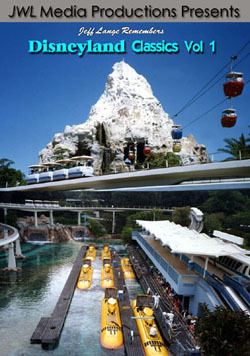 We love the view looking down Main Street from Christmas tree point. 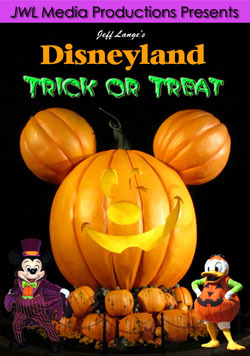 Mickey and Minnie (below, left) still are near the front of the parade. 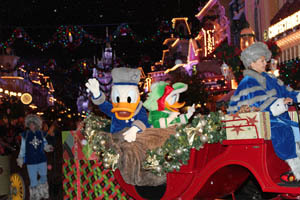 Donald Duck (below, right) waves to us as he sits next to Daisy. 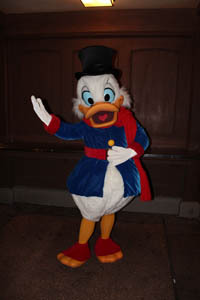 The first two nights, Daisy was on this side of the car, it was nice to see Donald as well! 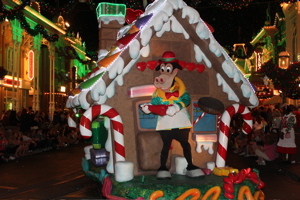 Horace Horsecollar (below, left) is ready for the holidays, in front of his gingerbread house. 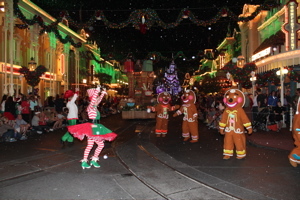 The crowd-pleasing gingerbread men (below, right) make their way down Main Street USA. 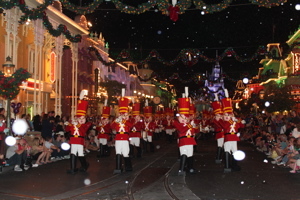 Toy Soldiers are one of the highlights of the parade for us (below, left). 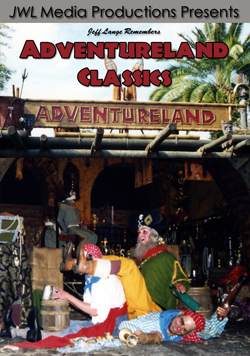 And Santa Claus ends the procession (below, right), waving to all the good boys and girls. 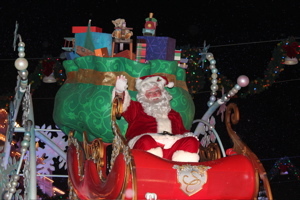 Actually, this year the “title” float is at the back, just behind Santa Claus. 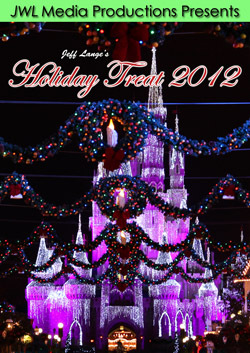 Video #3 – Mickey’s Once Upon a Christmastime Parade 2012, Mickey’s Very Merry Christmas Party – Magic Kingdom – Mickey’s Very Merry Christmas Party at the Magic Kingdom has kicked off for the 2012 season! This is our video of the Mickey’s Once Upon a Christmastime Parade, which has one major change this year – the title float is now at the end after Santa, and a larger-than-ever group of characters lead the parade instead! 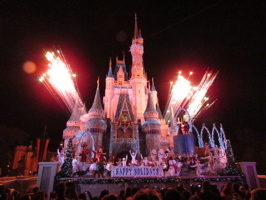 During Mickey’s Very Merry Christmas Party, we enjoyed the first “Celebrate the Magic” show. 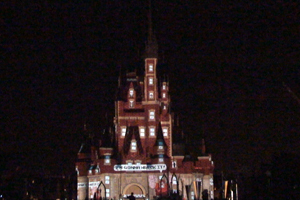 It is similar to the former “The Magic, The Memories, and You!”, with projections on Cinderella Castle. 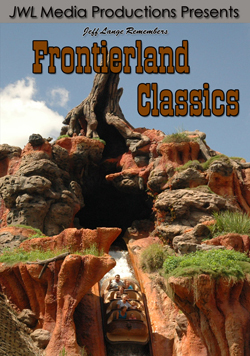 Walt Disney himself appears at the beginning and toward the end. 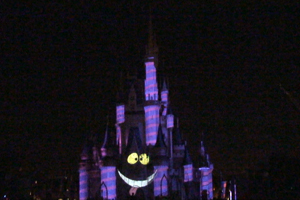 The Chesire Cat smiles on Cinderella Castle (below, left) near the beginning of the show. 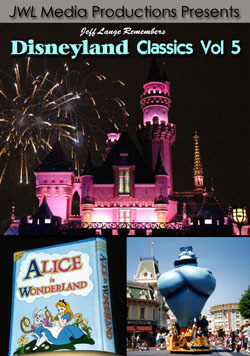 The Wreck-It Ralph segment (below, right) has been an instant hit! 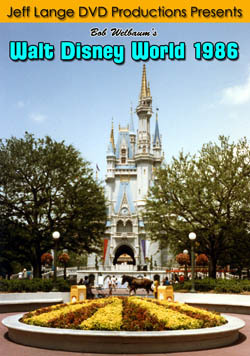 Remember the 25th Anniversary Cinderella Castle Cake? 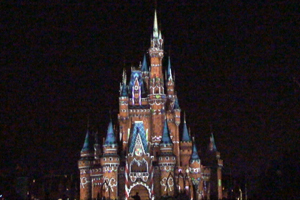 If you hadn’t seen it in person, you can see it here during the holiday segment (below, left), just like during last year’s “The Magic, The Memories and You!” Cinderella castle also turns to gingerbread (below, right). 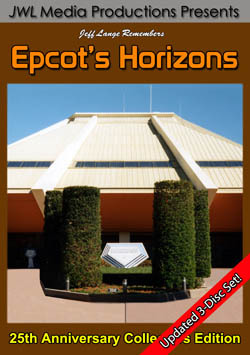 Video #4 – Celebrate the Magic! 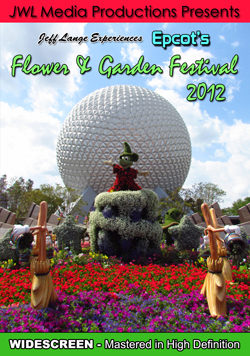 Projection Show Opening Night, Wreck-It Ralph, Magic Kingdom Walt Disney World – The Celebrate The Magic! 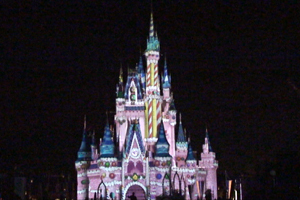 show debuted tonight at Mickey’s Very Merry Christmas Party! 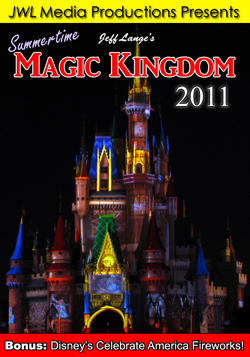 This new castle projection show replaces ‘The Magic, The Memories, and You! 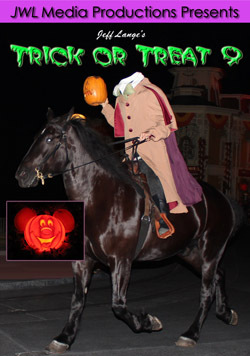 There are scenes from “Brave” with Princess Merida, “The Lion King”, Wreck-It Ralph and much more! 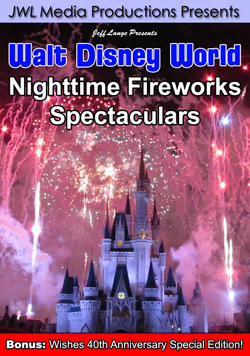 Holiday Wishes fireworks: Celebrate the Spirit of the Season (below, left) is more beautiful than ever, with extra projections on Cinderella Castle (below, left). 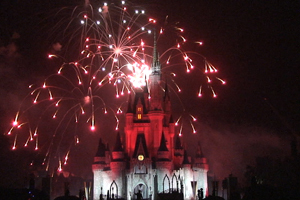 We always love seeing Cinderella Castle change back to “ice” as the fireworks end. 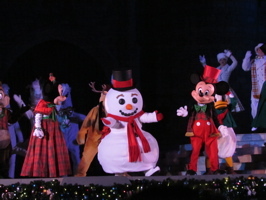 Frosty the Snowman (below, left) dances around during the Celebrate the Season show. 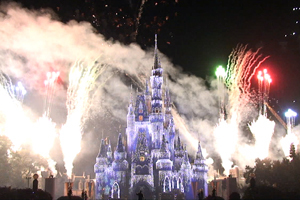 Fireworks (below, right) blast off behind Cinderella castle during the finale. 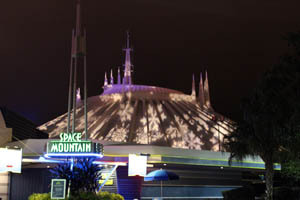 There are more projections than ever around the Magic Kingdom, including snowflakes on Space Mountain (below, left). 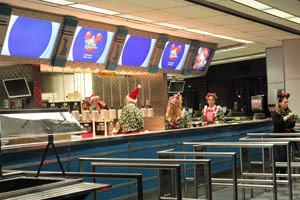 Cast Members hand out hot chocolate, apple juice, chocolate chip cookies and snickerdoodles (below, right). Gluten free cookies are also available upon request. 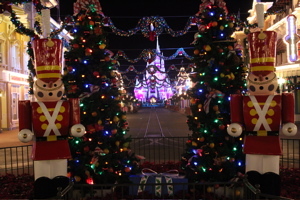 Cinderella Castle shines brightly between these two trees that are flanked by toy soldiers (below, left). 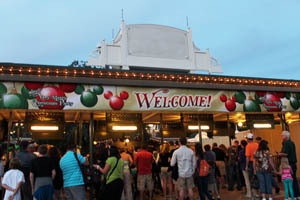 Candy Cane Garden is where guests can find Santa Claus (below, right). 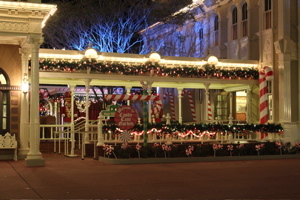 We had a great time as always at Mickey’s Very Merry Christmas Party this year!